Thank you all for the name suggestions for this latest quilt. They were all quite creative, and much better than anything I came up with! 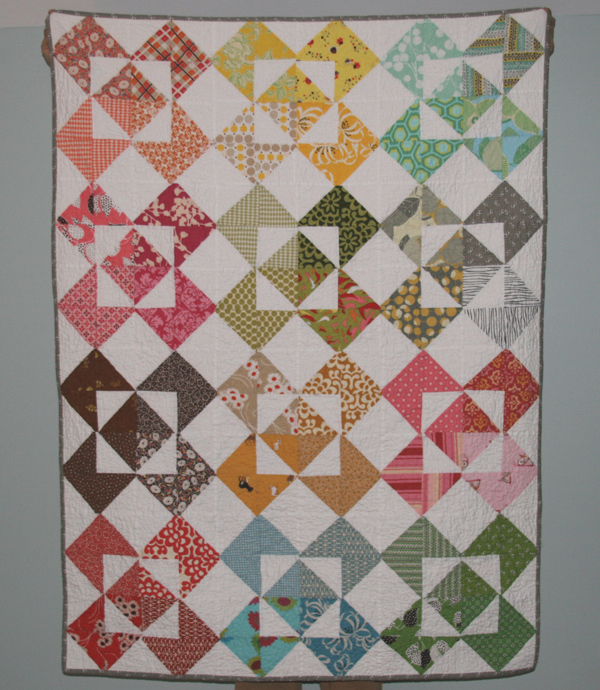 I think Windmill Whimsy is quite fitting, so many thanks go out to Jacquie at Tallgrass Prairie Studio. 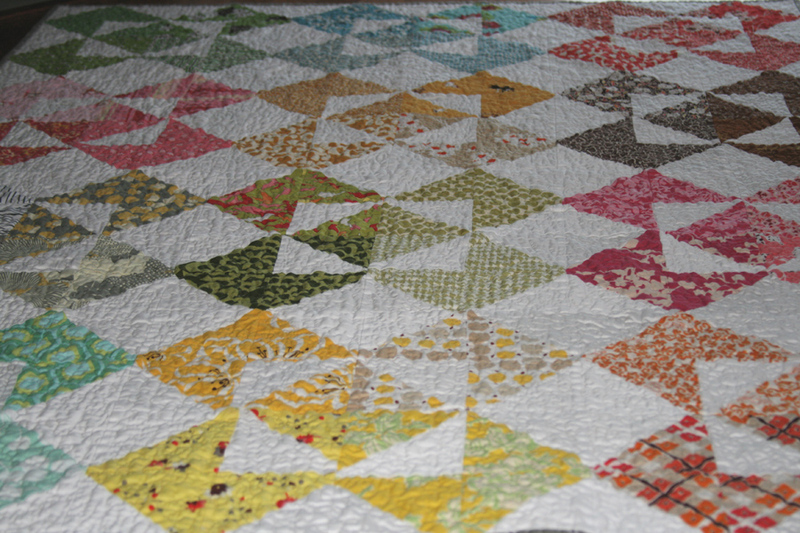 The back of this quilt is mainly white again, but I sewed together one more of the colored blocks. I didn’t have enough fabrics with a purple hue to do a purple block on the front, so instead I used one purple fabric to create a block for the back. I opted for dark gray for the binding. I think it goes nicely with all the colors on the front, as well as with the white and purple on the back. 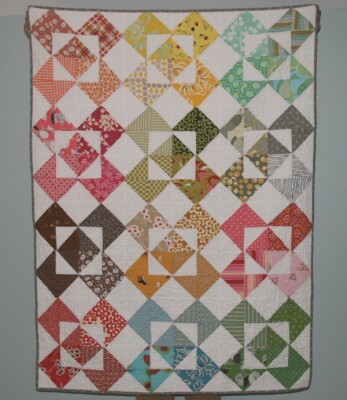 This entry was posted in [search] Other Quilts, 2008 Finished Quilts, Finished Quilts, Household Sewing - bags, napkins, pillows, Posts about Quilts, Quilts and tagged Amy Butler, denyse schmidt, Fabric, flea market fancy, free motion, handmade, quilt, quilting, rainbow, windmill. Bookmark the permalink. 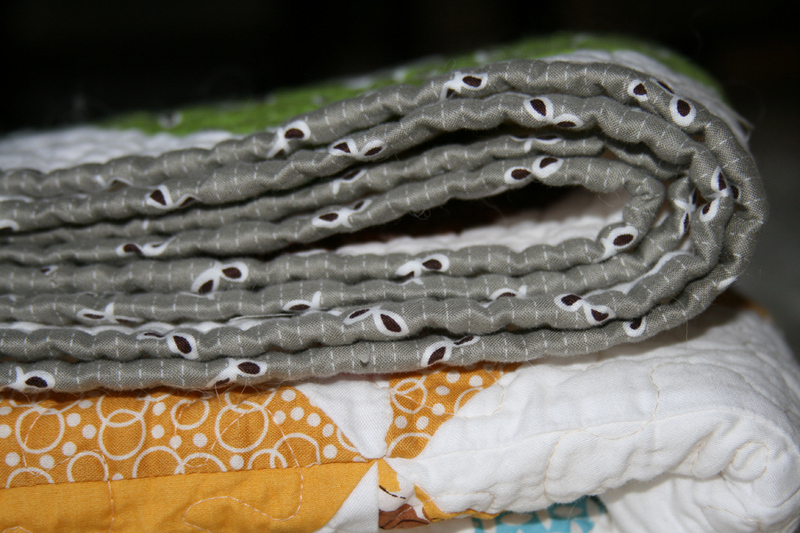 Oh you’re so fast once you get a quilt started!! It’s beautiful. Love it. 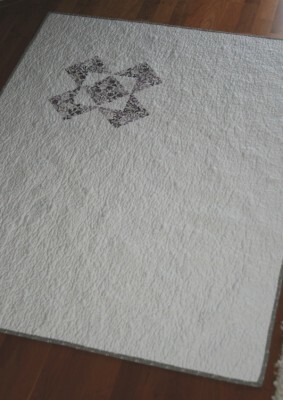 And the single block on the back?? perfect! 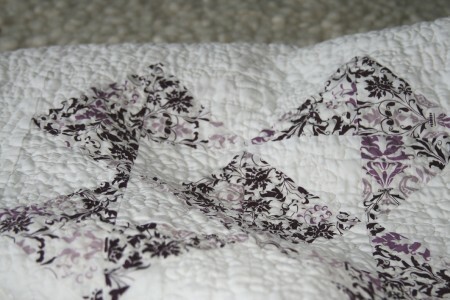 This quilt is adorable!! It’s so fun and clever! This is my favorite! So colorful, orderly and scrappy at the same time. I think that’s the perfect size for a lap quilt. Great job! 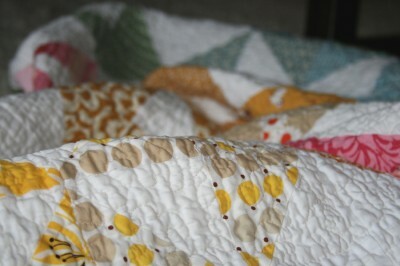 I love the quilt for the scrappy and colorful quality. And it has a fun design, too. Congratulations! I love the back of this one! I never bother doing anything creative for the backing. I may have to change that and try something different next time! It’s beautiful – the back and the front! And I love the quilting! So impressive, Ash! Too many quilts, huh? Maybe you should start selling them! I had a dream the other night that you quit your job and started being crafty full-time! We were also wedding dress shopping together! It was quite hilarious because in the middle of trying on dresses, there was a fire alarm and next thing I knew, we were at my school helping the kiddos get out of the building for the fire drill! Miss ya! 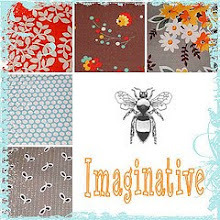 it’s a great name for a great quilt! windmill whimsy! 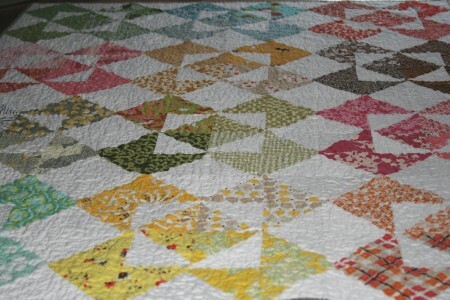 I showed a friend this quilt and she’s decided to make it. I wrote up instructions for her, and I was wondering if you’d mind if I posted the instructions on my blog, linking to your blog, of course. Just discovered your blog – someone recommended your market bag tutorial. I’m glad I stopped by, I just LOVE your quilts. The newest one is quite stunning. I’d love to try something like that myself, but I’m a bit terrified of triangles… Anyway, thank you for sharing your beautiful work! It’s so gorgeous. love it! Gorgeous! I might have to try this one myself. Wow….have just found your blog….a quick question: what is the size of the WindmillWhimsy block and do we have permission to use it. 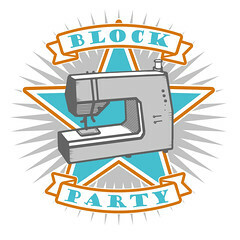 I have lots of scraps that would make these block and would love to try this. Thanks. Keep up the beautiful, creative work. Grandma Betsy. I love your work. 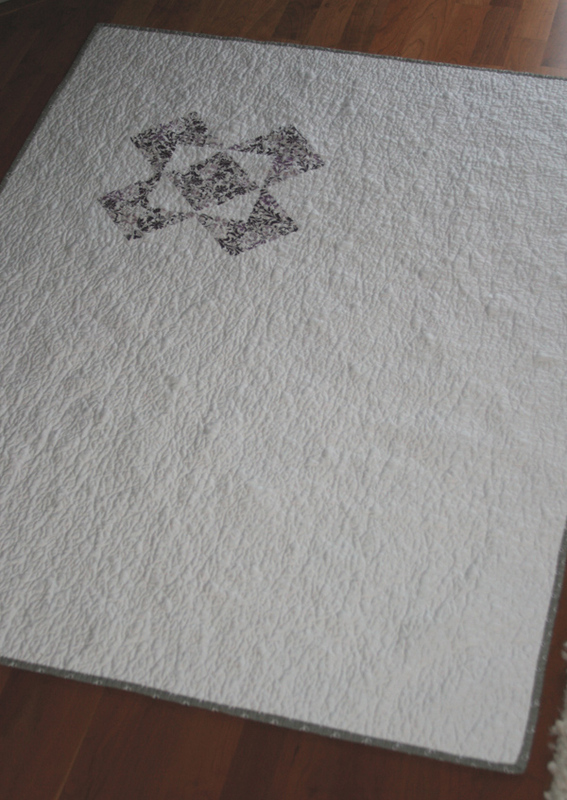 It’s a nice compromise between traditional blocks and modern fabric. May I use your image in a podcast assignment that I have to do for a grad class? (I have to put together an instructional podcast. 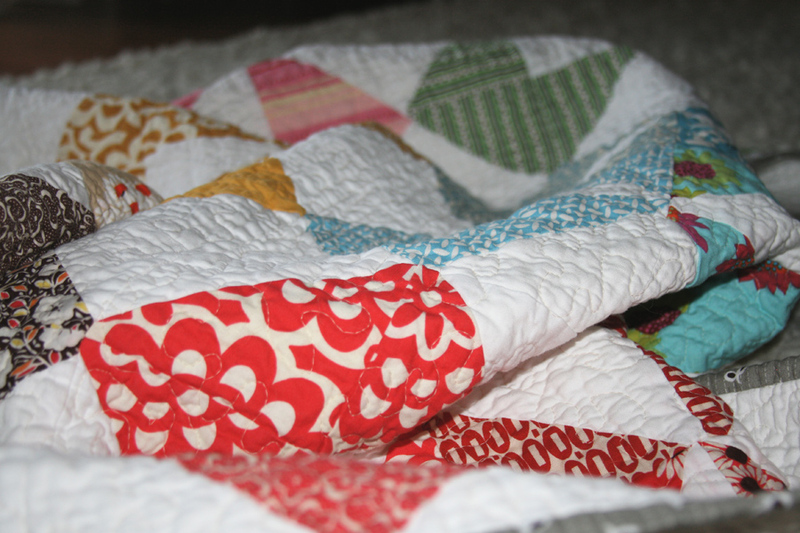 I chose quilting because then I could do something fun for credit!!) I would appreciate it!